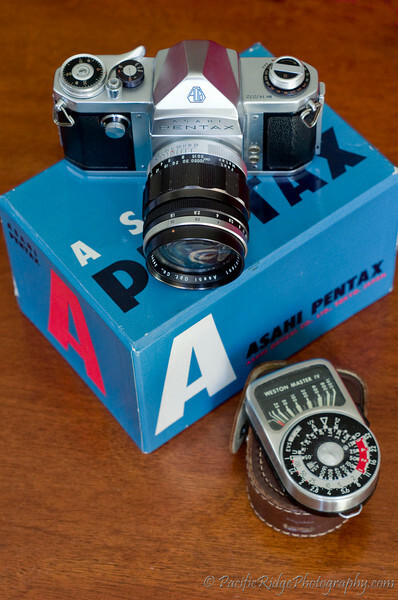 Following the Asahiflex line of camera, Asahi set out to release a SLR based on the Pentaprism through the lens viewfinder. 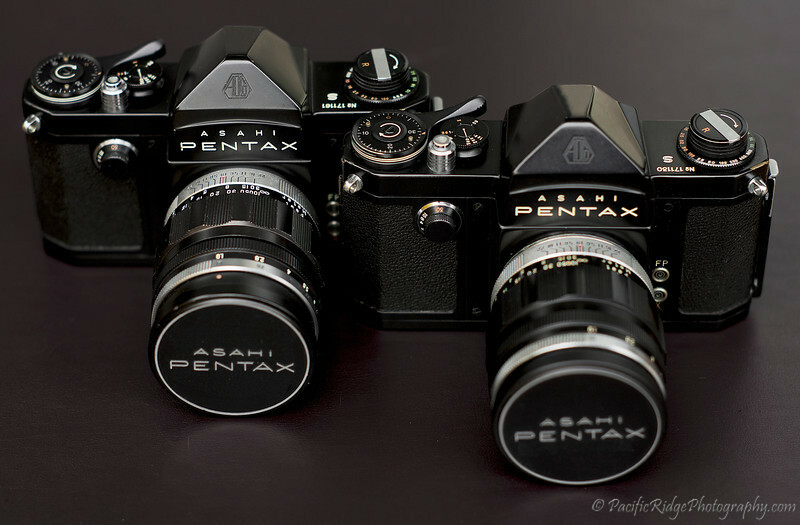 This is my personal favorite line of Pentax cameras and was the last set to be made before the mass produced S / H line, (although they are beautifully made too!). 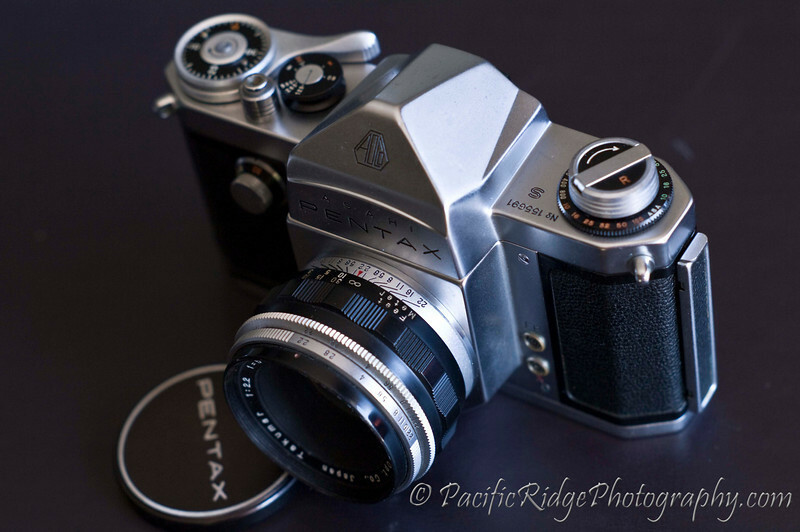 The 1958 Pentax S - The S included a slight standardization over the AP. The K was released shortly after the S, resulting in very few numbers of these cameras being released. 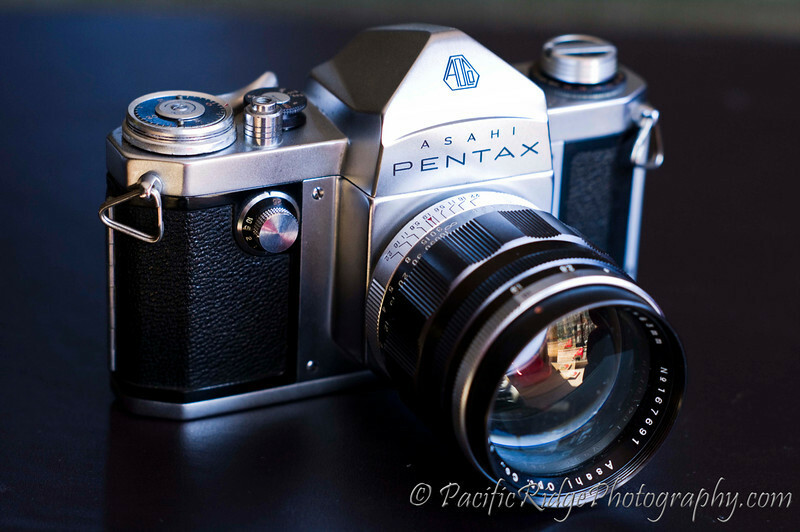 The 1958/59 Pentax K - Adding a (semi) auto aperture. 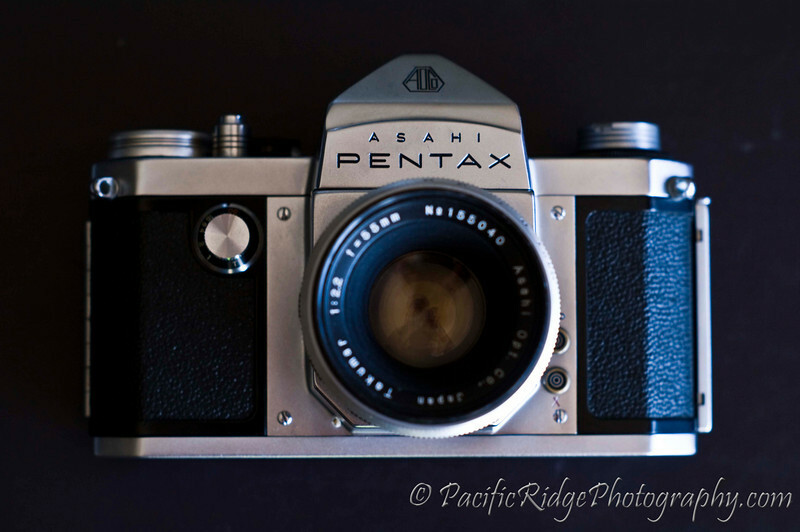 Here is my 1957 Asahi Pentax. This is arguably the world's first commercially successful SLR. 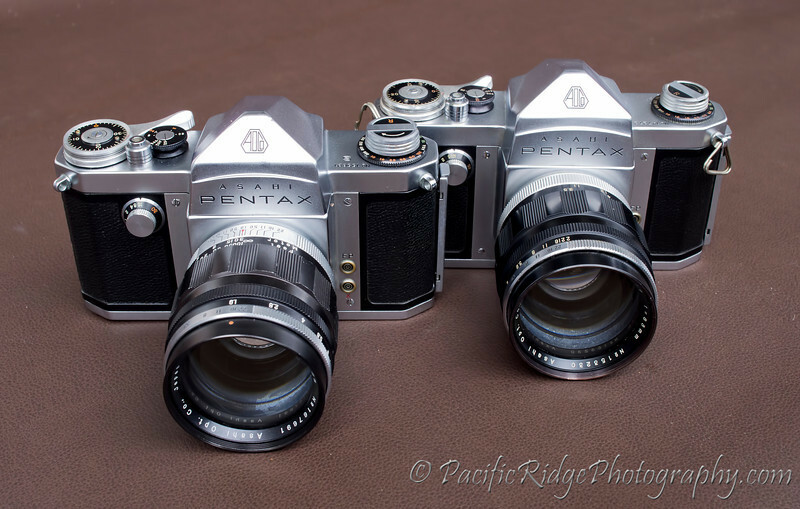 I say arguably because there were a few SLRs produced all the way back to 1933 with Exakta in Germany, and the better known Contax S from 1948. 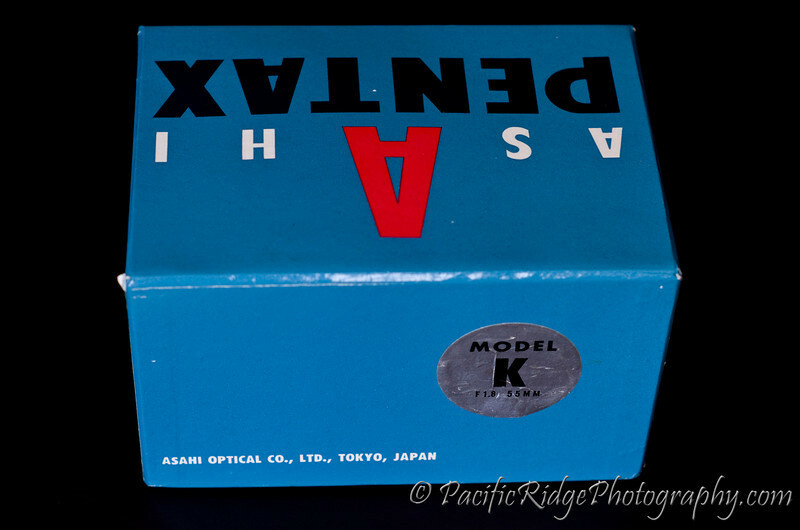 The success of the Asahiflex line provided R&D capital for Asahi to develop a Pentaprism based camera and in 1957, a model named "Pentax" was released. 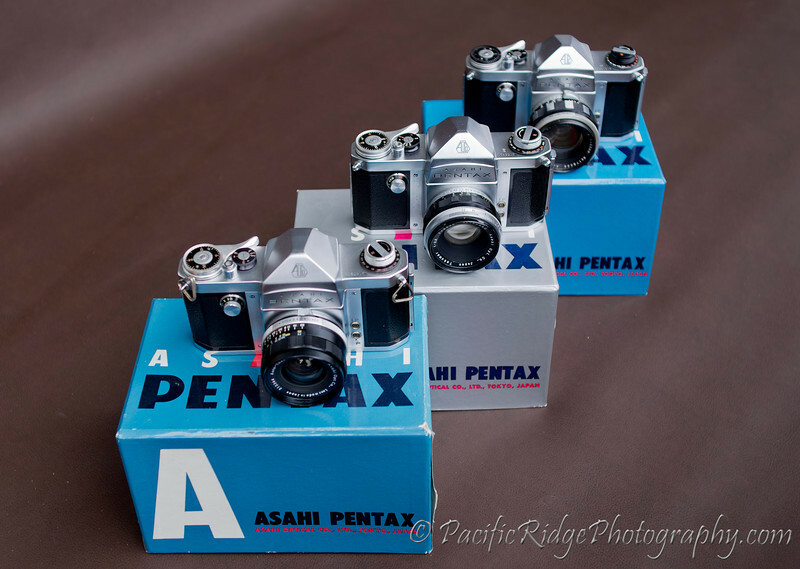 The camera was extremely well received, so much so that Asahi decided to change the company name to the one we are familiar with today; Pentax. Other manufacturers followed with similar designs, notably the Nikon F which was released 2 years later in 1959. 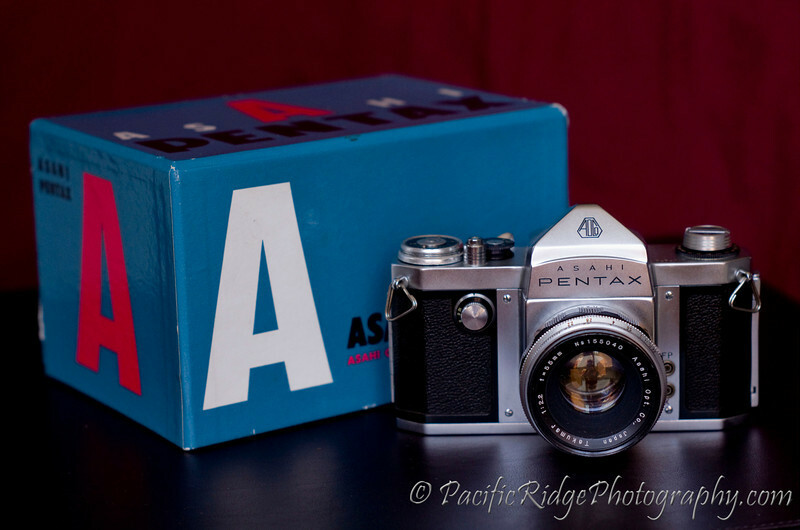 Another view of my 1957 Asahi Pentax, along with a Weston Meter. The lens attached to the camera is the rare Takumar 83/1.9. 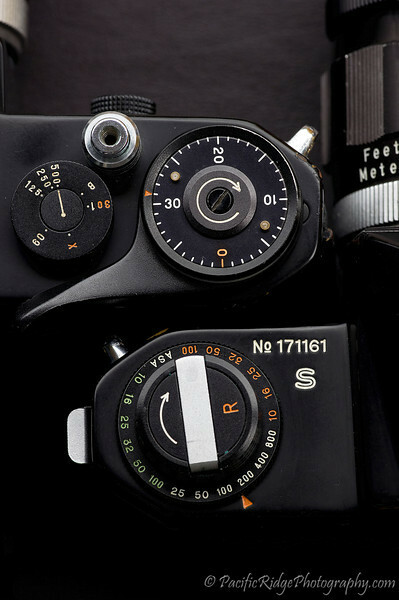 In 1958, Pentax released the S. The main difference between the AP and the S is a change in shutter speed values to align with industry standards. The S was not the only version of camera produced by Asahi at that time, with the more advanced K being available as well. The S had a rather short production run, resulting in less than 5000 units being made. 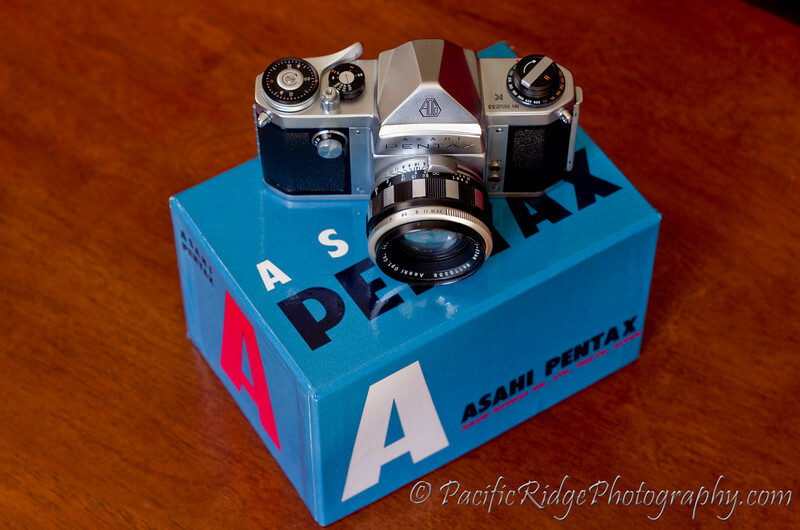 It can be very hard to find any of the original Asahi cameras, but the S is rarest of them all. Here are my 2 copies of the S in black. Another view of 2 Black S models. 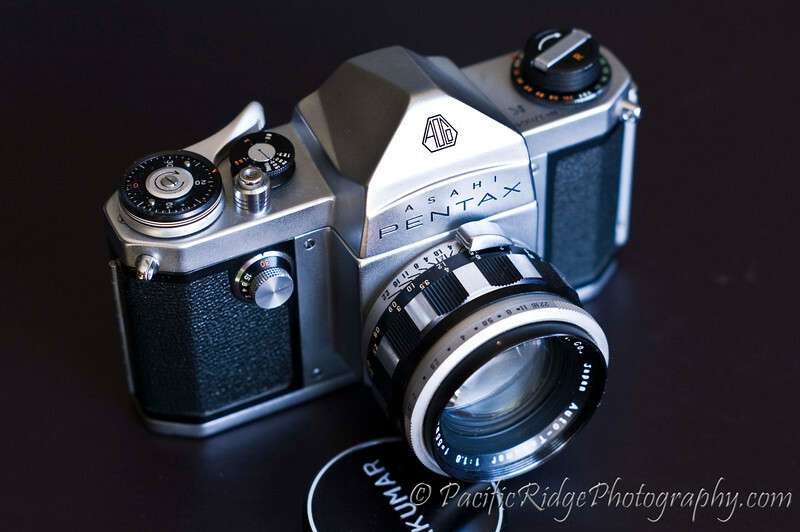 The front view of the 1958 Pentax S.
In 1958 Pentax released the K or "King". 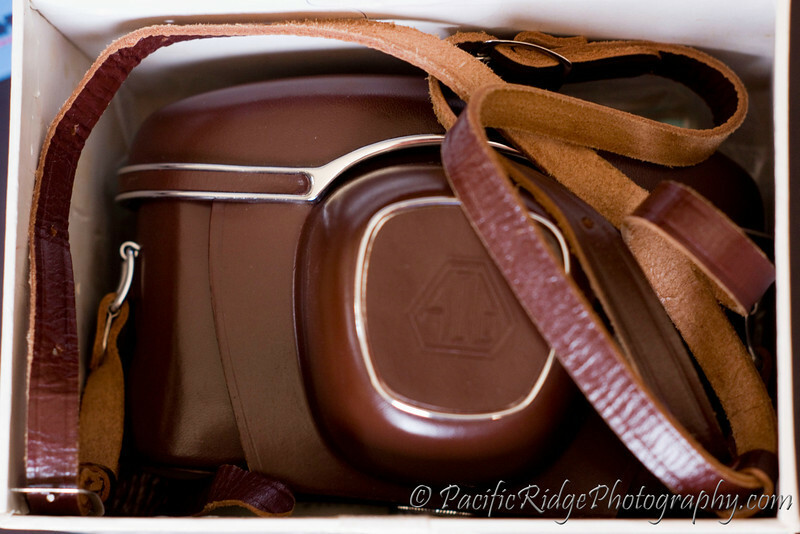 This was one of the first cameras with a (semi) auto-aperture feature. A tab on the side of the lens is spring loaded. Both the camera and the lens are cocked, then the shutter activates both the curtain and the blades inside the lens. This K had been found in a closet, where it had sat since it was purchased new. From the look of the camera, paperwork and case, it looks like it has been used very little, if ever used at all. Another shot of the box that came with the K.
This is the camera and case inside the box. Not a mark, rub etc on the case. 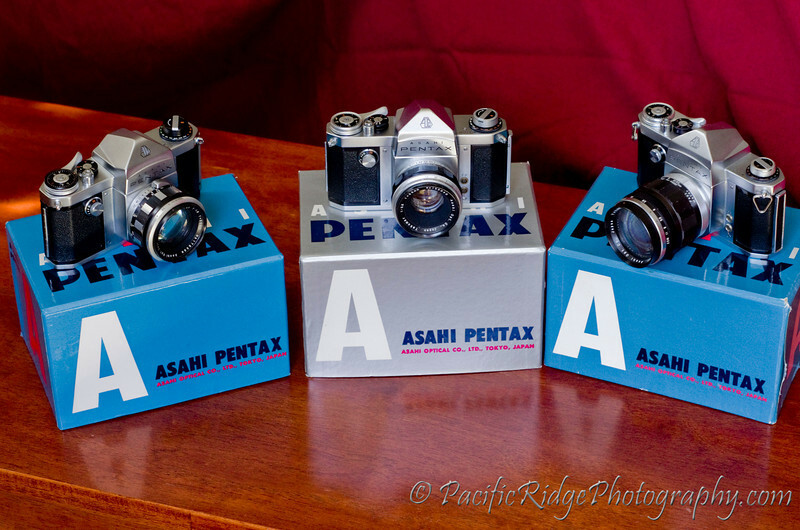 Finally, from left to right.....1957 Asahi Pentax AP, 1958 Pentax S, and the 1958 Pentax K. Both the S and K have their original lenses, but sadly, the AP did not retain it's original preset Takumar.